Today I went to the MPH Stock Clearance Sale. I have been looking forward to this sale for more than a year now. I went twice. I dropped in just before lunch, and then went again with Poey Chin in the evening before they closed. 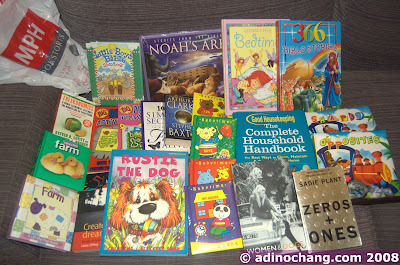 These are the books I got, which cost RM230. Some of these books will be used for Christmas and birthday presents, but a lot of them will be kept for Rachel. The entire hall was packed, because today is a public holiday. You could hardly move because every aisle and rack was lined with people browsing for books and searching for bargains. I had to look over people’s shoulders to browse books, occasionally mumbling an “excuse me” to reach in and pick up a book. The variety of fiction books and novels were quite disappointing. You won’t find many bestsellers in this warehouse sale. The discount on those books is about 15% off. Most of the books were the bargain bin variety, but if you look hard enough you may find some interesting books at a really cheap price (like RM2), or RM18 for a 300 page full colour, hard cover book. I was happy to see a large variety of children’s books at 30% off. I got lots of these as you can see from my picture. There are also Barney, Sesame Street, Bob the Builder and Dora VCDs going for RM11 each. There are also lots of cook books, teen category books and how-to-get-rich books but I didn’t see the prices. I was most impressed with the organization of the whole sale. The lines for checking out were clearly marked, with proper signs and well organized queues. A staff member was standing at the back of the line and guiding people to line up at the right place. The staff were polite and helpful in making sure the payment was quick and smooth. They did look very hot and tired though. Perhaps their boss should get them more cold drinks. They even offered to carry books to your car! Kudos to the organizing committee. They are doing a wonderful job and set the standard for conducting warehouse sales. We might go again tomorrow morning, or Saturday, or even on Sunday. They said that the books will be replenished each day so I’m trying to see what other books I can grab. Actually, let me tell you a secret… I live within walking distance to the stock clearance warehouse sale! How convenient is that? The sale will end on 5th May, and they open from 10am to 7pm (although they get all naggy and start asking you to check out around 6:45). Did you go to this sale? I kept looking out for familiar (or famous) faces but didn’t see anyone. Are you planning to go? Good bargains! But its just too troublesome for me. I will wait for the next one to come! Adino: Don’t worry, I will announce the next one!